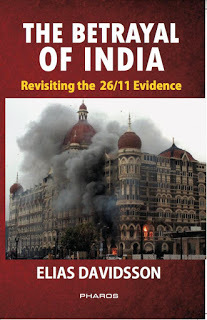 Now Elias is back with a new book on “India’s 9/11” – the 26/11/2008 attacks on Mumbai. Entitled The Betrayal of India: Revisiting the 26/11 Evidence, Elias’s new book shows that the Mumbai false flag operation was likely a two-part joint effort by US/UK operators (the “foreign segment”) and Indian intelligence (the “domestic segment”), with a possible Israeli segment as well (the attack on the Jewish center). Elias argues that supposed “26/11 mastermind” David Headley — a CIA agent who operated under DIA cover — is just a red herring who probably had nothing to do with the operation. Initial announcements by the Indian government that nine terrorists had been arrested — which later changed to “oops, those nine terrorists are actually all dead, we only have one live one” — are just one example of the countless lies, outrageous inconsistencies, and blatantly obvious cover-ups surrounding the events of 26/11. Did the US/NATO and its British partners orchestrate 26/11 to increase their dominance over India (i.e. “partnership in the ‘war on terror'”) and torpedo India’s move toward the Shanghai alliance? Or did Islamophobic ultra-nationalist Hindu extremists in India’s intelligence service RAW, together with equally ultra-nationalistic anti-Islam extremists in Israel’s Mossad, stage 26/11 as part of the long-term destabilization of Pakistan — whose end-game will be an attempt to take down Pakistan’s nuclear capability? Or is the correct answer “all of the above”? This show was broadcast on March 8, 2017. This entry was posted on Tuesday, March 7th, 2017 at 10:38 am	and is filed under 9/11, Anti-War, Censorship-Propaganda, Education, False Flag/Fake Terror, Freedom, Geopolitics, Justice, Kevin Barrett, News, Protest. You can follow any responses to this entry through the RSS 2.0 feed.